The P7 Probe is submersible up to 1000 ft. (300 m), therefore, you can measure total well depth in ideal conditions. The sensor at the tip of the probe provides consistent measurements with almost zero displacement. The tape seal plug design allows the probe to be quickly and easily replaced, if required. The P2 Water Level Meter Probe is shielded in design to reduce or eliminate false readings in cascading water. The probe consists of a stainless steel body with a neoprene heat shrink seal. It is not suitable for submergence to any significant depth. Its simple design makes it easy to repair. With a stand-alone design, convenient carrying handle, and sturdy probe holder, the standard reels are ergonomically designed for ease of use. They are robust and smooth running. The battery is housed in a convenient drawer in the front of the reel, allowing quick replacement. The reels are equipped with an on/off sensitivity switch, light, buzzer, battery test button, brake and a tape guide stored on the frame. 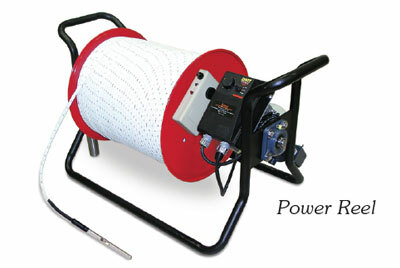 Power reels can be very useful to allow faster or less strenuous operation of longer lengths of tape. Small and medium padded nylon carrying cases are available, as an optional extra. Their design has a convenient shoulder strap, zippered front pocket, zippered top, and a grommet in the base to prevent moisture build-up.